I know a lot of you participate in Meatless Mondays, but this recipe is too good not to post right away…so just read it today, enjoy the rest of your Meatless Monday, and then make these knots tomorrow haha. 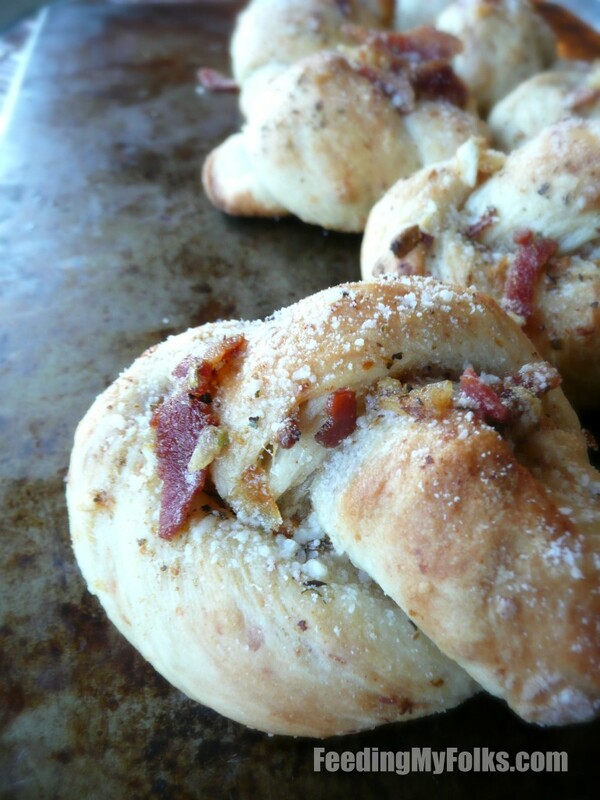 So yeah, this recipe is an amped up version of one of my favorite pizza parlor dishes – garlic knots. Yesterday morning I had to work and when I got home, I was feeling hungry and consequentially a bit “meh”. After nibbling on a few snacks, I decided to cook/bake. That kinda kept going for the rest of the day…whoops! Let’s just say that I went a little pizza dough crazy. 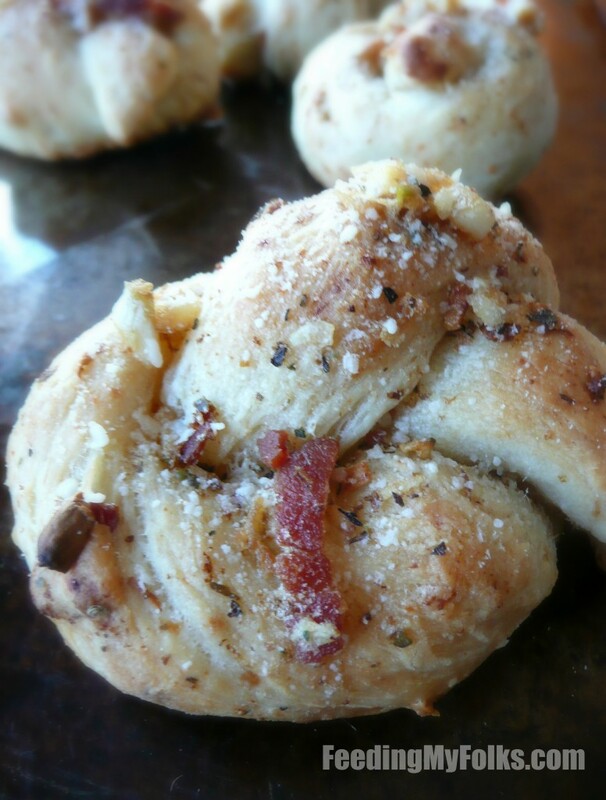 The garlic knot is a pretty straightforward thing, dough tied into a knot then topped with garlic and butter. 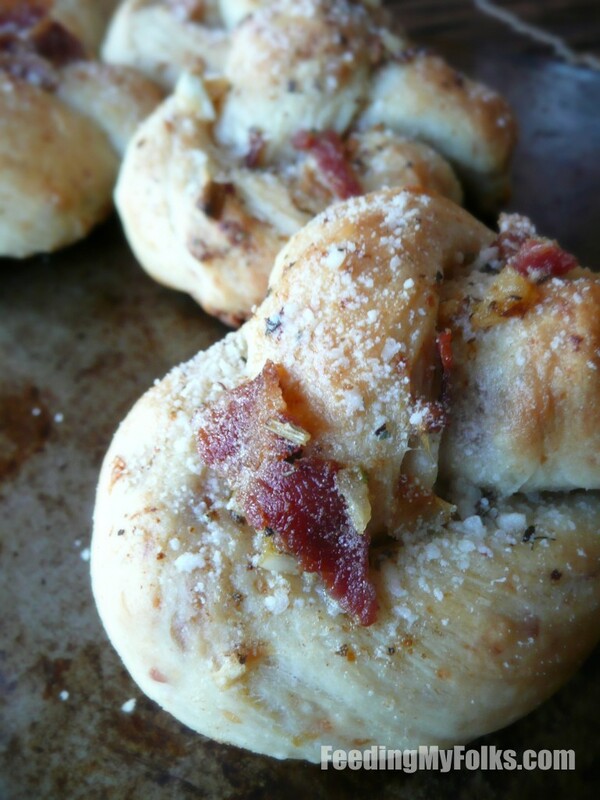 But my twist (pun intended), is that garlic AND bacon is kneaded into the dough. Every bite is flecked with deliciousness. And who woulda thunk to include bacon? This guy *thumbs up*. But even though it’s filled with flavor, the secret to making a great knot is actually the Parmesan cheese sprinkled on top. The cheese soaks up the butter and omg, it’s to die for. Don’t skip the cheese people. Just don’t. In a cold skillet, place the bacon. Cook over low heat for 6-8 minutes per side. When crispy, turn off heat and remove from skillet. In the skillet, add the butter and a little less than half of the minced garlic (the residual heat will melt the butter). Stir in Italian seasoning and re pepper flakes (if using). Reserve. Prepare the pizza dough as per the instructions, however, mix in the crumbled bacon, remaining minced garlic, and Parmesan cheese. Knead, then rise for 2 hours. Slice/roll into strips and tie those strips into knots. Brush knots with a little of the bacon/butter. Bake for 15-20 minutes, or until lightly golden. Warm the bacon/butter back up and then pour onto the knots. Sprinkle with Parmesan cheese. Nice! Can’t go wrong with garlicky bread, right? The more I stare at these, the more I crave them. I wish I could deliver you some! NYC needs a $1 g-knots place, yo.